GLD Dome is part of the brand new line of professional LED Portable Lamps designed by Generac Mobile®. Extremely lightweight, completely indipendent and with its low temperature, this remarkable LED lamp proves to be suitable for a wide range of application fields. 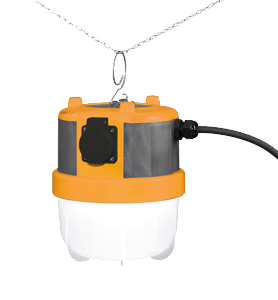 Housing in plastic anthracite/orange (polycarbonate) with edge guard made of soft thermoplastic elastomer (TPE), plastic cover in opal polycarbonate, retractable stainless steel mounting hook with safeguard, power supply cable with mains plug, socket/s (second cable entry optional).